Coupons, discounts, and special offers are a great way to increase traffic to a gym. Register Tape Network offers a unique coupon advertising solution that can give your business more than 100,000 impressions each month! 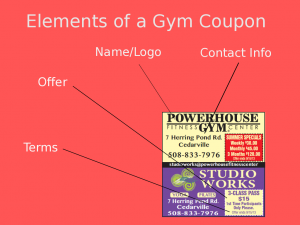 Read more to learn the elements of coupon design to help you create an offer for your gym or fitness center. If your gym isn’t hitting its goals for membership rates, it could be time to consider a coupon offer. In this article, we’ll discuss the unique challenges facing gyms and how coupon advertising, especially in supermarkets, can help overcome any obstacles. The difficulty in coupon advertising for gyms and fitness centers lies in the distribution. You want a wide distribution but in a fairly specific geographic area. Most customers are only going to travel so far — a few miles from their home — to exercise, so you want most of your offers to be concentrated within that area. Receipt tape advertising distributes your advertisement in supermarkets, Family Dollar, and Dollar General stores located near your gym. In this article, we’ll look at the best practices for crafting coupon design and determining an offer so for the most results. What are the elements of a great fitness/gym coupon? First, every coupon should have the name of your gym. Finally, the coupon should have a great offer. Most coupons have dotted lines surrounding the actual offer. This not only serves as a suggested perforation if people want to keep only the coupon, but they also highlight the offer. People automatically associate such perforation marks with discounts. Your gym can also place terms and conditions in small print beneath the coupon. Expiration dates and “cannot be combined with any other offer” stipulations protect businesses from being taken advantage of. After checking off the essential elements (business name, title, contact info, offer, and conditions), your fitness center can consider design. Companies like Register Tape Network use a team of designers to ensure that coupons are attractive, focused, and use art consistent with a company’s personality. Here are a few tips and tricks our designers keep in mind when designing your unique, full-color coupon. Bold Beats Subtle – This is the trifecta of any successful advertisement. Attention grabbing words, bolded buzzwords like “Free” and “Value,” perform well on coupons. They are an opportunity to directly sell to clients, so the flashier the better for coupon ads! Colorful Branding – The best coupons use coordinating colors that match a company’s colors and brand personality. Psychologists have studied the implied meanings of different colors, which you can discover here. Although not an exact science, businesses should stick to certain color schemes for overall consistency. Eventually, customers associate these colors with your shop, also known as brand recognition. Logo – Coupons not only provide an incentive for new customers to visit your gym, they also build stronger branding. Adding your logo can strengthen brand recognition before they’re redeemed. What Offers Work for Gym and Fitness Centers? Before crafting an offer, it’s in the gym or fitness center’s best interests to survey the market. The average price of gym memberships certainly varies by region and gym type, so it’s important to have a general idea of what your competition is doing. Most gyms have higher fixed costs — costs of equipment, etc. — than variable costs, or additional costs per gym user. Because of this, free trials aren’t as “expensive.” Offering free trials is a great way to boost traffic, without tearing away at the bottom line. Keep in mind, however, that free trials are most effective for new gym goers. If membership retention rates are low, your gym may want to consider a discounted monthly rate. Discounts are more costly to gyms, but they have a different effect than free trials. Free trials can attract to gym members, while rate discounts can help with retention. This is where it’s important to study the market in your area to craft an attractive offer that isn’t financially burdensome. Register Tape Network partners with thousands of retailers in 33 states and has helped several gyms and fitness centers diversify their marketing to gain a stronger presence in their communities. Here are just a few notes from our many satisfied customers.